A quick heads up for a useful resource on the Easter Rising. Although the Sinn Féin Rebellion Handbook from 1916-197 is available to search on the FindmyPast website at http://search.findmypast.com/search-world-Records/the-weekly-irish-times-sinn-fein-rebellion-handbook-easter-1916-1917, I have also just discovered it available free of charge at the Internet Archive, at https://archive.org/details/sinnfeinrebellio00dubl. The handbook collects various articles from the Irish Times that were published throughout the rebellion. FindmyPast, in the blurb for its collection, notes that it provides "an official list of the casualties, names of prisoners, photographs, and important maps of key locations in Dublin city at the time". Don't forget to also consult Military Archives (www.militaryarchives.ie) for additional resources on those involved with the Easter Rising on the Irish side. Many thanks for your query and for your comments on the digitised collections. It is good to know they are proving to be a useful resource. 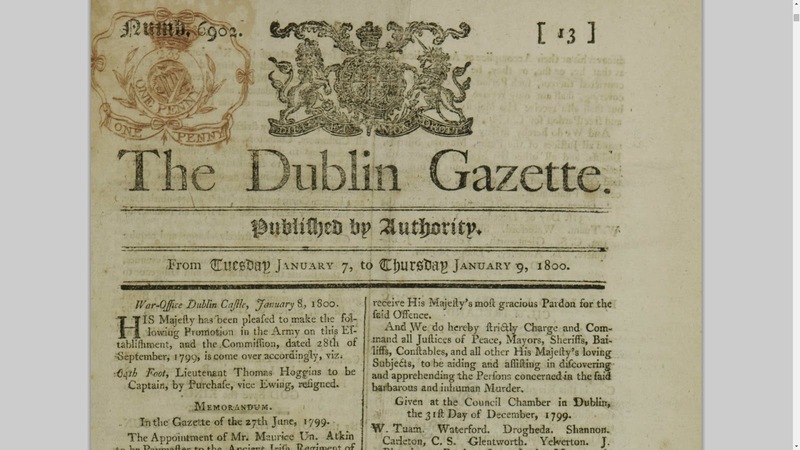 From having reviewed the digitisation project files as far as I am aware all of our issues of the Dublin Gazette were digitised. To my knowledge there are currently no plans to digitise Iris Oifiguil. If anything changes in this respect I will let you know. To search for all the online editions from 1750-1809, visit the Oireachtas Library catalogue at http://opac.oireachtas.ie/liberty/libraryHome.do, where you will find many, many other valuable publications that have been digitised also. If planning to go to an archive, library or museum tomorrow (Monday 31st) in England, Wales, or Northern Ireland, you might want to check if it is open first - it's a bank holiday. Scotland, meanwhile, stands defiantly open for business...! Source: West Yorkshire, England, Removal and Settlement, 1627–1912. Digitized registers and loose papers. West Yorkshire Archive Service, Bradford, Calderdale, Kirklees, Leeds, Wakefield, West Yorkshire, England. Source: Beckett Street Cemetery Records. Digitized registers. West Yorkshire Archive Service, Leeds, England. Further details are available via the links. Over 330,000 Manchester electoral registers are now available to browse. The Manchester Electoral Registers 1832-1900 include both the registers for local government elections; Citizens’ Rolls and Burgess Rolls, and the registers for Parliamentary Elections; Parliamentary Electoral Registers. The records are scanned copies of microfilms held at the Manchester Archives Central Library and cover Ardwick, Bradford, Beswick, Cheetham, Chorlton-Upon Medlock, Harpurhey, Hulme, Newton, Salford, Broughton and Manchester. In 1974 all boroughs of Manchester were combined formally to create Greater Manchester. Derbyshire Hospital Admission & Deaths contain nearly 4,000 records taken from two different sources: Derbyshire Royal Infirmary, Deaths 1892 – 1912 and Victoria Memorial Cottage Hospital, Ashbourne Admissions 1899 – 1913. The Victoria Memorial Cottage Hospital was opened in Ashbourne in 1899 and was in operation for 65 years until its closure in 1964. The Derbyshire Royal Infirmary was first built in 1810 and rebuilt following a typhoid outbreak in 1890. Queen Victoria laid the foundation stone for the new hospital in 1894 and the hospital stayed in operation for over 100 years. Each record includes a transcript produced by the Ancestral Archives of Derbyshire. The New Zealand, Nelson, Petition after the Wairau Incident 1843 records list the names of nearly 600 settlers who signed a petition calling for action to be taken by the Governor of New Zealand following the notorious Wairau affray. The Wairau incident occurred on 17 June 1843 and was the first serious clash between New Zealand Company settlers and the local Ngāti Toa. Following a dispute regarding the settlement of the Wairau Valley, local Māori chiefs had the settlers temporary abodes burnt to the ground. The company responded by sending 49 armed men to arrest the chiefs resulting in a confrontation that left 22 settlers and 4 Māori dead. An investigation by the newly appointed Governor, Robert FitzRoy, found that the settlers claim to the land had been invalid and the chiefs were exonerated. Many settlers were enraged by the findings and submitted a petition that, along with active lobbying, resulted in Fitzroy being recalled in 1845. The latest podcast from the National Archives in England (www.nationlarchives.gov.uk) is an overview of Security Service files that have been released this month. It's a short introduction by Professor Christopher Andrew, available at http://media.nationalarchives.gov.uk/index.php/security-service-file-release-august-2015/ or for free via iTunes. There is an accompanying news release at www.nationalarchives.gov.uk/about/news/latest-top-secret-mi5-files-released/. Further updates and news on the consultation will be available in due course via www.scotlandscensus.gov.uk. 1841 - 1989 now online! 1959, 1976, 1988 & 2000 (added) now online! 1950 - Current now online! 1908 - 1979 now online! COMMENT: Looking forward to the Munster Express coming soon! Scottish Research Online course starts next week! My next Scottish Research Online course starts next Wednesday September 2nd 2015 and runs for 5 weeks - and there are still a few spaces available! The course teaches you how to get the very best from some of the most useful online records sites for Scottish family history research, with five structured lessons, a weekly online chat session with myself as the tutor, a dedicated discussion forum available to students throughout, and some fun along the way! For more on the course, its contents, what past students have thought of it, and how to sign up, please visit the Pharos Teaching and Tutoring Limited website at http://www.pharostutors.com/details.php?coursenumber=102. Hopefully I'll see a few of you there! Full price and ordering information via the website. Records for the four cemeteries managed by Wyre Council in North Lancashire are now available on www.deceasedonline.com. With the new addition of Wyre Council, Deceased Online now has nearly 5 million records for 60+ cemeteries and crematoria in Lancashire and Greater Manchester available on the website. A complete record of the deaths of Scottish seafarers from late Victorian times until 1974 is being made available online for the first time through ScotlandsPeople. Among the 14,000 new records available through ScotlandsPeople are monthly returns of the Deaths of Seamen, which list Scots along with other crew members of all nationalities who were serving on British-registered vessels between 1897-1974. The records were compiled by the Registrar General of Shipping and Seamen. Only the Scots can be searched for by name. "Scotland is a maritime nation with fascinating stories and an important seafaring history and these new online registers will provide wider access to this heritage. I welcome the addition of this new resource that NRS is making available, which is part of the story of Scotland and will encourage people from across the world and at home to find out more about Scotland's seafaring heritage". COMMENT: For more on the responsibilities of the English based Registrar General of Shipping and Seamen, and his responsibilities to the General Register Office of Scotland, the areas that he was responsible for, and those that he wasn't, consult my book Discover Scottish Civil Registration Records, available in print or as an e-book (please see my Books section at http://britishgenes.blogspot.co.uk/p/my-books.html for distributors in England, Australia, and Canada). As this illustrates, not everything concerning the civil registration of Scots' vital records is on ScotlandsPeople - a lot of it isn't even in Scotland! This August Bank Holiday weekend, come rain or shine, we’re opening up our site to give you FREE access to more than 1 billion UK records. We’re also giving you a first chance to try out our new features such as LifeStory, Facts View and Gallery—and discover the stories behind the names. Free Access starts this Friday, 28 August*. *Access to the records in the featured collections will be free from 28 August until 11:59 p.m. GMT on 31 August 2015. To view these records you will need to register for free with Ancestry.co.uk with your name and email address. We will then send you a username and password to access the records. After the free access period ends, you will only be able to view the records in the featured collections using an Ancestry.co.uk paid membership. To see a full list of the records in the featured collections please visit http://search.ancestry.co.uk/search/group/uk_irish_records?o_xid=67198&o_lid=67198&o_sch=Email+-+Campaigns. Scottish children are to be automatically issued with library cards from birth, aged three, or upon entry to Primary One, in several pilot schemes being set up across the country, including the Mitchell Library in Glasgow. The aim is to promote better literacy within children at a younger age. The full story is available at https://www.commonspace.scot/articles/2243/children-to-be-given-library-cards-in-drive-to-promote-early-years-literacy and http://www.bbc.co.uk/news/uk-scotland-scotland-politics-34048868. Comment: This is just another reason for arguing why library services should be retained across the UK (they are not just for genealogists!). Those seeking to cut library funding anywhere in the UK should beware of the damage they are creating in the process. Libraries lie at the very heart of our communities. Congratulations to both Wendy Hibbitt and Peter Higginbotham on receiving certificates of recognition from the London based Society of Genealogists (www.sog.org.uk). The certificates are for 'exceptional contributions to genealogy by individuals and institutions'. This year’s Angus Heritage Week, which runs from 4-11 September, features several free events providing help, expert advice and inside information about tracing a family tree – and discovering more about those who appear on various branches. On Sunday, September 6, anyone with a connection to the fisher families who lived and worked along the Angus coastline can search for information about their forebears in the Auchmithie Archives, which will be on display at the Annie Gilruth Hall in Auchmithie. The Auchmithie Archives include historic documents from the late 19th and early 20th century, newspaper cuttings and photos of residents of the clifftop fishing village in days gone by. The Angus Archives at Restenneth Priory by Forfar provides safekeeping to over 800 years of documents recording the history of the county’s people and places. “Although a lot of basic genealogy information is available online, nothing beats looking through the original records and the thrill of spotting the name of one of your ancestors,” said Craig Pearson, archivist, Angus Council, who is hosting two free family history workshops at the Angus Archives during Angus Heritage Week 2015. At the family history workshop on Thursday, September 10, Craig will provide a guide to making the most of the historic documents held at the Angus Archives and, in particular, school and poorhouse records and legal papers. On September 11, the second family history workshop at the Angus Archives will focus on uncovering the details which can transform family history research from a list of names, dates and places into a spellbinding story to rival any Hollywood blockbuster! “Both of these workshops are a chance to explore sources that can’t be found online and discover how they can flesh out a family’s history,” said Craig, who added that, as both workshops are expected to be popular, booking is highly advised. For the full programme of events happening during Angus Heritage Week 2015, visit www.angusheritage.com or pick up a copy of the Angus Heritage Week Event Programme at leisure centres, ACCESS offices, libraries, museums and tourist attractions across Angus, Dundee, Perthshire, Aberdeenshire and Fife. Containing over 11,000 records, the Church of Ireland parish record search forms filled out by Irish Public Records Office staff while dealing with Old Age Pension applications. The pension was introduced in Ireland 1864 (Chris - incorrect, it was 1908!) and record office staff would be required to prove an applicant’s eligibility by checking dates of birth in parish and census records. Since many births, marriages or deaths were not recorded in Church of Ireland registers, confirmation of the applicant’s age would then be looked for in the 19th Century censuses. Many Irish census records were destroyed in the Public Records Office fire of 1922 making these records and invaluable census substitute for those with Church of Ireland ancestors. The forms were used by Record Office staff to document their findings and often contain notes on other family members uncovered during the course of their research. Each record contains a transcript and an image of the original search forms. The information varies according to what kind of search was carried out but will usually list the applicants name, birth year, parents name as well as the source type, year, parish and county. COMMENT: Census records were also used for proof of age with the pension - for the equivalent search forms for these, as held at the NAI in Dublin, visit http://censussearchforms.nationalarchives.ie/search/cs/home.jsp. PRONI (www.proni.gov.uk) also has additional books for the north (Form 37s) which are indexed via www.ireland-genealogy.com. Note also that when consulting Church of Ireland vestry records on microfilm, you may also find some photographed letters to the local minister asking for proof of age for pension purposes. I'm just back from a fantastic day in Motherwell at the Lanarkshire Family History Show. I turned up just before 11 in time to give a talk on the use of British and Irish newspapers for genealogical research, which was well attended, and then spent the afternoon talking to vendors and catching up with a few folk! We had a choir from St Patrick's Primary School in Coatbridge at lunchtime to entertain us, many speakers, help on hand from various experts, ScotlandsPeople and more, and a real buzz all day - a huge congratulations to Lanarkshire FHS (http://www.lanarkshirefhs.org.uk) for a great event! My day ended with a get together of members from the Scottish Genealogy Network, who were on hand during the day to help out with advice for folk with brick wall problems. Next year's Scottish Association of Family History Societies' conference is to take place on Saturday 23rd April 2016 at the splendid surroundings of New Lanark Mill, one of our Scottish gems and a world heritage site. Details on this will be available on the SAFHS website later in the year (www.safhs.org.uk), and the organisers for the conference will be Lanarkshire Family History Society - should be a great event! Annan, Scotland – To celebrate the “Lanarkshire Family History Society Local and Family History Show” (the largest family history show in Scotland) www.scottishindexes.com is releasing thousands of historical Scottish paternity records. The total number of paternity records now indexed is 11,723! Scottish Indexes is also using the ‘Sponsor an Index’ initiative to fund some indexing and major new releases of indexes mental health records and prison records are planned in the coming year. TheGenealogist has released online 99,500 records of London synagogue seat-holders spanning the years from 1920 to 1939. Fully searchable by name, keyword, synagogue and address, the Jewish Synagogue Seatholders has been extracted from various years of: "Seatholders for Synagogues in London"
The latest podcast from the National Archives in England is entitled War Girls – poetry and prose by women in the First World War. It is a 13 minute talk from Ruth Sillers, based on extracts from her book War Girls, and can be downloaded from iTunes free of charge, or listened to at http://media.nationalarchives.gov.uk/index.php/war-girls-poetry-prose-women-first-world-war/. The University of Glasgow's A History of Working-Class Marriage project is running a postgraduate masterclass on September 12th entitled From Institution to Intimacy: Courtship, Marriage and Marriage Breakdown in Historical Perspective, c.1650 to 2000. Access is to postgraduate students only - full details are available at http://workingclassmarriage.gla.ac.uk/postgraduate-masterclass-12-september-2015/. Thanks to David Underdown (@DavidUnderdown9) for the tip off via Twitter that FindmyPast (www.findmypast.co.uk) has added the English and Welsh probate calendars from 1859-1958 to its site, in a database entitled Probate Calendars Of England & Wales 1858-1959. A searchable version is available at http://search.findmypast.com/search-world-Records/probate-calendars-of-england-and-wales-1858-1959, whilst a browse only version is accessible at http://search.findmypast.com/search-world-Records/probate-calendars-of-england-and-wales-1858-1959---browse. Upon an initial play with the collection it's not perhaps quite as user friendly as its equivalent on Ancestry (which extends slightly further up to 1966), in that for surnames it asks for the first letter only. When I type in a search for a family member I know had an admon granted in 1922, David John McFarlane, by using M for the surname and David John for the forename, I get 21 hits that I have to check. A search using the full name McFarlane does not work (in the surname field). On Ancestry, when I type in David John McFarlane for the search terms, it pops up straight away. The calendar records are also freely available on https://www.gov.uk/search-will-probate, with much more of them (essentially up to the present day), considerably more search fields available (e.g. date of death), and from where you can also order copies of the original wills and admons. But at least it is useful to see another presentation of the collection online. We’ve added new records and images that were previously missing from this collection, for years 1871, 1877, 1904, 1922, and 1930. We added more than 300,000 new images (including more than two million records) from bishop’s transcripts to the Gloucestershire parish register collections. Starting in 1598, ministers were required to make copies of their parish registers on parchment. These copies are known as bishop’s transcripts and can help fill in the gaps when the original parish registers are no longer available. The records have been processed to increase visibility for an additional 19 million records. Electoral registers are lists of individuals who are eligible to vote. Registers typically provide a name and place of abode, and older registers may include a description of property and qualifications to vote. Morning. I have begun a project to index the administrators, executors, and also the addresses in the Calendars of Probate and Administration from 1931-1939. I would be interested in finding one or two people with Excel expertise to help out. The years 1933-1935 are broadly complete (perhaps with 5% dataloss) and can be freely searched online by surname of executor/ administrator. By capturing the full addresses from the calendars, we can see who else lived in our ancestral villages, or perhaps find a married aunt listed with the same address as a known family member. COMMENT: Although the printed calendars are available on Ancestry and the relatively new probate site from the UK government for the two countries, they are only indexed by the name of the deceased, and not the executors, so this sounds a potentially useful tool. If you can help, please drop David a note at student325@hotmail.com. Hi there fellow genealogy enthusiasts. Have you heard about our summer special offer? If you would like to join or re-join as a member of the Society we will, until the end of August, waive the normal GBP 10.00 joining fee. So all you pay is GBP 51.00 inland or GBP 33.00 overseas for over a year’s membership. 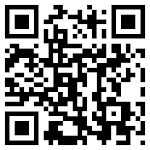 You can join online at or an application form can be printed from www.sog.org.uk/membership. More information about the Society can be found at www.sog.org.uk. While stocks last, you will also receive a free My Heritage, Family Tree Builder Genealogy software CD. Please use or quote code SSP15 on the website or in the space provided on your application form to waive the joining fee. Why not do this now, the offer runs out on Bank Holiday Monday and if it’s good weather you won’t want to be inside signing up when you could be out and about. unlimited access to all the records on the site for 12 months from the time of purchase. No more rationing your site credits or having to go through the payment process every few weeks (or hours, for our power users) to buy new ones! the ability to filter your search by Parish instead of the broader District – you can select one parish or multiple parishes from a new drop-down list that appears when a subscriber logs in. This is very helpful when you want to search in just one parish or one parish and its adjacent parishes. We will probably add some more search filters or other capabilities in the upcoming months. We are not offering the option to pay in monthly installments at this time. If there is high demand for that, we will look into it. We will not auto-renew the subscription; we will remind you when it's time to re-subscribe and will offer you a "loyalty discount” on the subscription price. We are not offering to cash in your existing credits; they are still perfectly good and you can use them up at your leisure and buy a subscription later if you like. We intend to always offer a wide range of options for everyone from the person who buys one record at a time to the person who needs to see hundreds of records per month. We will continue to offer both credits and the ability to buy a single record or as many as you want via the shopping cart. If you're interested in a subscription, click Purchase (on the site), which can also be found near the login boxes. Please let us know what you think of the new subscription feature! 7,569 baptisms at South Shields St. Hilda spanning 1868-1879, from the Bishop's Transcript with extensive checking against the parish register. 1,277 marriages at St. Oswald's in the city of Durham, from the start of the first register in 1538 to the end of 1700. There are no marriages surviving from Dec 1592 to May 1598. 105 baptisms at the Zion Methodist New Connexion chapel on Zion Street in Sunderland, covering 1809-1836. 209 marriages at Denton St. Mary in Darlington district, ranging from the start of the first register in 1673 to the end of 1812. Also included are banns that were called here but were not followed by a marriage here. (The couple may have married elsewhere, changed their minds and not married, or they may have married at Denton but the marriage was not recorded in the register.) We now have a continuous run of marriages at Denton from 1673 to 1837. 792 baptisms at Pittington St. Laurence, spanning 1651-1700, filling a gap we've had for a very long time. We now have a continuous run of over 300 years of baptisms at Pittington, from the start of the first register in 1574 to the end of 1905. Updated 524 burials spanning 1700-1739 and 1759-1761 at Pittington St. Lawrence in Durham district, adding dates and names where they had previously been judged illegible, or clarifying that the date or name was faded to invisibility if it truly was not readable. Also added 45 burials, mostly from Oct 1727 to August 1729, that had been missed or had been thought to be illegible. all of our marriages (399) spanning 1848-1902 at Hutton House St. Peter & St. Paul Roman Catholic church in Hutton Henry, plus 2 marriages we missed and 12 new marriages to extend the collection to the end of 1903. Updated 2,583 baptisms for the years 1863-1884 at Wingate Grange Holy Trinity in Easington district, adding father's occupations and abodes where they had been omitted earlier, and correcting errors. We also added 5 baptisms we'd missed. Let’s Hear It For Our Heritage! 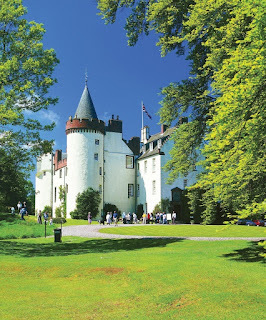 Angus Heritage Week, which runs from 4-11 September 2015, highlights the unique people, places and customs of the county, past and present, with a packed programme of special events, talks, tours and exhibitions. Kirriemuir Festival of Music & Song, which is from 4-6 September, is one of the week’s key events. This weekend of superb traditional music features ceilidhs, competitions for musicians, singers and bands, impromptu gigs, sing-along evenings and street entertainment throughout the town of Kirriemuir, which has an excellent reputation for top quality live music. And the festival finishes on a high note on Sunday evening with a concert in Kirriemuir Town Hall by The Peatbog Faeries, one of Scotland’s best-known contemporary folk bands. On Sunday, 6 September, it’s Steam Sunday at the Caledonian Railway in Brechin, when steam trains will make their way to and from the stations at Brechin and Bridge of Dun. Steam Sundays take place on the first Sunday of the month throughout the summer months so if you’ve been promising yourself a trip, make a note in your diary for 6 September as this will be the last Steam Sunday of 2015. In celebration of the strong tradition of needlework in the Angus area, Glenesk Folk Museum is holding a handiwork workshop at The Retreat, Glenesk, on Sunday, 6 September. Needlework experts and novices – and everyone in between - are invited to bring along examples of their handiwork and share ideas, skills and tips with other knitters, sewers, crocheters and embroiderers. In addition, from 11am until 12.30pm and from 1.30pm until the event closes at 3pm, acclaimed spinner Kay Anderson will be spinning yarn and sharing her knowledge of this fascinating skill. Several talks are being held during Angus Heritage Week, including two at Kirriemuir’s Gateway to the Glens Museum on 9 September. At 1pm that day, local historian David Orr will give a talk about the Castles of Angus, from the famous ones such as Glamis Castle to the historic gems hidden away at Inverquharity and Cortachy (pictured above). In the evening, another highly-respected local historian, David Ketts, will discuss The Tay Bridge Disaster and share his thoughts on why the bridge crumbled into the River Tay on December 28, 1879, taking a train and its passengers with it. And for those who like to go further back in time, on 10 September, a 16th century Benedictine Monk will take visitors to Arbroath Abbey on very special guided tours around the medieval monastery. The National Archives (www.nationalarchives.gov.uk) at Kew in England is currently hosting an exhibition on the Jacobite rebellions of 1715 and 1745, within its Keeper's Gallery, with many documents on display to illustrate the story of the two campaigns. The exhibition will run until January 2016. I've just made a discovery concerning the Dublin Gazette, the official newspaper of record in Ireland prior to January 1922, which I was not previously aware of. Until now I was aware that some editions of the newspaper were available online via the British Library's 1700-1800 Burney Collection, sourced mainly from 1708-1712, 1724-1725 and 1797, whilst 47 issues between 1707 and 1909 are available via the subscription based Newspaper Archive (http://newspaperarchive.com). 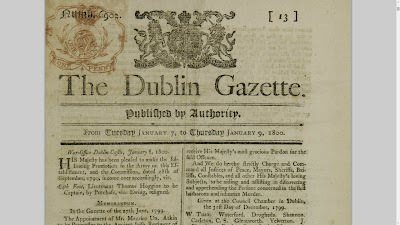 Fifty years worth of Dublin Gazettes, from the 1750s to 1800 are linked to from the site, with the originals hosted at the Oireachtas library website at http://opac.oireachtas.ie. The Houses of the Oireachtas contain the two institutions of the Republic's national parliament, Dáil Éireann (the House of Representatives) and Seanad Éireann (the Senate). The editions are those held by the Oireachtas in bound volumes, which have been digitised into hefty sized PDF files of about 1GB each. I've just downloaded the file from 1800, and it was 1.1GB and took about 25 minutes to download - thank God I upgraded to a new computer last weekend, as I don't think my previous one would have liked it! Nevertheless the quality is superb, and the good news is that the newspapers are keyword searchable, the editions having been OCRed. It may take a while for me to download these, but I suspect they are going to prove to be useful! The National Monuments Records of Wales has a useful post online about its various maps collections, which are available for consultation by researchers at its facility in Aberystwyth and online through its Coflein service at www.coflein.gov.uk. The blog post is available at http://heritageofwalesnews.blogspot.co.uk/2015/08/maps-at-national-monuments-record-of.html. Following last year’s successful Homecoming event at Haddo House last year, the Aberdeen and North East Scotland Ancestral Tourism Partnership would like to invite you to join us in Stonehaven Town Hall on Saturday 26th September for a free Family History and Heritage event. You'll be able to chat to people from the Aberdeen and North East Scotland Family History Society, the Family History Society of Buchan, the Aberdeenshire Libraries Local Studies team, the National Records of Scotland and Deceased Online - plus many more! A series of talks will also be taking place throughout the day. Well known genealogist Chris Paton will be speaking, as will the weel kent Gordon Casely. COMMENT: I'm looking forward to this, as I haven't been to Stonehaven before! The event kicks off at 10.30am and continues until 4.30pm - the venue is Stonehaven Town Hall, Allardice Street, Stonehaven, AB39 2BU. For further details contact pastley@aberdeencity.gov.uk or call (01224) 522116. The Scottish Theatre Archive, part of the University of Glasgow Library's Special Collections Department, has a new web platform at http://special.lib.gla.ac.uk/collections/sta/. There is also a review of the Scottish Theatre Archive's On Stage: a Knowledge Exchange initiative from 2014-15 at https://universityofglasgowlibrary.wordpress.com/2015/08/17/on-stage-with-the-scottish-theatre-archive/. The latest podcast from the National Archives (www.nationalarchives.gov.uk) in England is entitled Waterloo men: the records of Wellington’s Waterloo army, a 16 minute long talk from Carole Divall. It can be downloaded for free from iTunes, or listened to at http://media.nationalarchives.gov.uk/index.php/waterloo-men/. The Republic of Ireland's Certificate of Irish Heritage scheme (www.heritagecertificate.ie) is to end after August 24th 2015, due to the fact that very few people have wanted to buy them. Since its launch in 2011, just 3000 of the certificates have been sold. 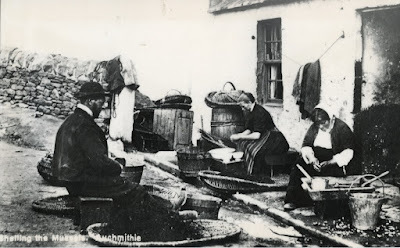 Despite its noble aim to allow those with Irish ancestry to register their family connection to Ireland - similar to our Book of Scottish Connections here (http://www.nrscotland.gov.uk/registration/book-of-scottish-connections) - the scheme became something of a shambles after it changed its levels of proof in 2012 which were required to establish such an Irish connection. This was done in a bid to reverse the low take up back then, but as is clear, even this did not work. My blog post from the time can be read at http://britishgenes.blogspot.co.uk/2012/08/certificate-of-irish-heritage-shambles.html - it ends with my take on it back then: "I can't help feeling that if it looks like a dead duck, makes no noise like a dead duck, contributes to world peace as much as a dead duck, and swims as badly as a dead duck, then in all probability it is really very likely to be a dead duck...". The BBC has the story at http://www.bbc.co.uk/news/world-europe-33973972. You'll find the cards on Ancestry (www.ancestry.co.uk) and the National Archives website (www.nationalarchives,gov.uk) at Kew. Apologies for the brief gaps in posting, but I took the plunge over the weekend to upgrade to a new computer. For several years my old trusty PC has been running on Windows XP, an operating system I have been loathe to leave behind (even though it is no longer supported by Microsoft), but several other factors have finally led me to buy a new PC, this time one operating on Windows 8.1. I had the option to upgrade immediately to Windows 10, but figured I would see how the ground lies with that first, as I have been getting mixed messages about how good an idea that may or may not be. Up until now I have been using XP on my PC and Vista on my laptop, so was very wary about upgrading. My wife has 8.1, and the screen on her laptop has been terrifying me every time I have looked at it! In fact, the move has been relatively painless. The one major loss that I am feeling is the absence of Outlook Express, I'm still not a big fan of the Outlook.com replacement, though I have established that to access that I am much better simply going online to look at my emails - the set up there is much more like that of Outlook Express, and I think easier to use. My real joy though was to discover that I can in fact run Family Tree Maker 2006 on Windows 8.1. Although I use the latest incarnation of Family Tree Maker for my own personal research, FTM 2006 is still my programme of choice for client research, as it has no bells and whistles, and simply does the basic things I need it to. There was a message flagged up saying there was a compatibility issue, but you can choose to run it anyway, and when I do, it works fine (something I have found from lots of online testimonials from other users). I've kept my old PC, however, because it is a useful hard drive for another back up, and there are a few other older programmes and things I can do on it that I would be scared to try on the new stack - not least the continued upgrade of my family history website, which runs on Tripod (Trellix), which now only allows users to make changes using an older version of Internet Explorer. So far the user experience has not been at all traumatic - there is a wee bit of a learning curve, but it's more of a gradual slope to climb than a mountain! The Irish family history show, Back to Our Past, is due to return to the RDS in Dublin from 9th-11th October 2015. Admission each day costs €5, and in addition to the usual vendors, there is also three days of talks available to attend from many of the great and the good on the Irish family history scene. 1/10. Paul Hollywood delves into his family history, finding out about his maternal grandfather's experiences in the Second World War, serving as an anti-aircraft gunner in Tunisia and Italy. The Great British Bake Off judge then digs deeper, learning about his Scottish ancestry - and how one of his forebears held down a very demanding job. Ancestry has added a new database entitled UK, City, Town and Village Photos, 1857-2005, containing images from the Francis Frith Collection. Despite the title, the collection includes images from across Britain and Ireland, not just the UK. The collection is accessible at http://search.ancestry.co.uk/search/db.aspx?dbid=60587 and can be searched by keyword or browsed by locality. The UK branch of FindmyPast (www.findmypast.co.uk) is offering a 50% discount this week on its World subscription rate using the code WDYTYA50, to tie in with the new series of Who Do You Think You Are, which kicks off tomorrow evening (Thursday). The normal rate is £129.50, so with a discount it is £64.75. Note that FindmyPast.com is also offering a 50% discount to Irish Central readers - simply register at http://www.findmypast.com/irish-central-offer-50. The normal US rate is US$199.50, so with a discount it is US$99.75. Worth crunching the numbers and the exchange rates to see which is best to join, because the available records are the same on both the US and UK platforms. The UK option looks to me to be cheaper just now. I should add that a few years back I joined FindmyPast.com when it launched via its Pioneer subscription, at just over US$59. I've kept renewing at that rate, and have just received a renewal notice claiming the company tried to claim $199.50 for a new subscription, but it failed as my card had expired. Because of this email I actually took out a new subscription using the Irish Central offer instead, but then queried it when I got an email yesterday asking me if I wanted to renew my original account at the Pioneer rate! I was told that a discount would have automatically been applied to give me the subscription at the Pioneer rate, but this was not mentioned in the original email. FindmyPast is now refunding me the $99.75 from my new account (effectively cancelling that subscription) and allowing me to renew on my original account at $59. Worth flagging up for any other Pioneer subscribers who may received similar emails! UPDATE 14 AUG: Apologies, the rate I previously gave for the UK was the British sub rate, not the World sub rate - now duly corrected. The Association of Genealogists and Researchers in Archives (AGRA), an English and Welsh based association for professional genealogists, has launched a new version of its portal website at www.agra.org.uk. It's important to note that not all professional genealogists based down south are members of the body, but the organisation does provide a code of conduct for members to adhere to and sets certain professional standards for membership, which may provide some reassurance if seeking to hire a researcher to carry out work on your behalf. Statutory birth, marriage and death indexes for 2014 are now available to search on ScotlandsPeople. You can now view the updated indexes for statutory records until the end of 2014, and in addition to this, images for births until 1914, marriages until 1939 and deaths until 1964. You can also purchase an Extract, a fully certified copy of a birth, marriage or death certificate, for 12GBP. For more information on purchasing an official Extract, please read more. Incidentally, if you are interested in finding out more about the law behind Scottish civil registration from 1855 - when and where events had to be registered, what the informant legally had to do in the process, what the registrars had to do, plus all the background to Scottish civil registration records both online and offline (and within Scotland and beyond!) - my Unlock the Past guide book Discover Scottish Civil Registration Records is currently available on special offer from Gould Genealogy in Australia until August 31st at just AU$12 (inc GST) - see www.gould.com.au/Discover-Scottish-Civil-Registration-Records-p/utp0284.htm. The book can also be purchased for £7 from My History in England (+p&p) via http://www.my-history.co.uk/acatalog/Scottish-Civil-Registration-UTP0284.html#SID=876, and in Canada from Global Genealogy at http://globalgenealogy.com/countries/scotland/resources/2590284.htm for just C$17. 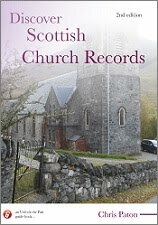 There is also an ebook edition available worldwide from Australian based Gen-eBooks at http://www.gen-ebooks.com/discover-scottish-civil-registration-records.html for just AU$7.95. The Federation of Family History Societies has a short news feature about images from Essex being added to the HistoryPin website (www.historypin.org) by the local record office (http://seax.essexcc.gov.uk/). For those carrying out research in London, it has been announced by London Underground workers that two further strikes are to take place. These will occur from 18:30 BST on Tuesday 25 August and at 18:30 on Thursday 27 August - each to last 24 hours. It may be best to check with any archive or library you wish to visit if the strikes will have any likely effect on services. The National Library of Ireland has opened a new First World War themed exhibition in Dublin, entitled Portraits of the Invisible. 'Portraits of the Invisible', an exhibition of portrait photographs of Irish men and women involved in World War 1 has opened at the National Photographic Archive. The exhibition, held in partnership with the British Embassy, features a selection of the photographs collected and catalogued during a series of World War 1 roadshows since 2012. These were held as part of Europeana 1914-1918, an initiative that encouraged people across Europe to bring family letters, photographs and keepsakes from WW1 to be catalogued and digitised. 'Portraits of the Invisible' features a selection of images of soldiers and medics, nurses and stretcher bearers, drivers and cyclists, sailors and pilots, accompanied by the stories their families have treasured for generations. In addition, audio recordings bring the words written by the participants in the war in their letters, postcards and diaries, to life. The BBC also has a story on the exhibition at http://www.bbc.co.uk/news/uk-northern-ireland-30815277. Genealogist Emma Jolly has drawn attention on her Facebook page to a campaign by the Fire Brigade to have a Second World War Home Front fireman recognised by a Blue Plaque in Southwark. The full story is available at http://www.southwarknews.co.uk/history/blue-plaque-nominees-2015-the-ww1-hero-who-could-throw-a-bomb-74-yards/ and you can vote for the Southwark Blue Plaque nominees online at https://www.surveymonkey.com/r/ZFYHYZ6. Did your ancestor claim a grant for a Scottish university? For over a century the Carnegie Trust for the Universities of Scotland has provided grants to students wishing to attend university. Until the introduction of government grants, we were the main source of support for students of low income backgrounds and we think we have played an important role in increasing social mobility and educational attainment for generations of Scots. The trust always kept index cards recording the details of its grant recipients and we now have a database with the scanned cards. Although we can’t make the database accessible online, we will happily look up records for anyone who requests a search. We think this resource would be of interest to family historians and social historians. A sample of the cards can be viewed online at http://www.carnegie-trust.org/alumni/archive-of-student-records.html, along with the request form to fill in should you wish to make an enquiry.